Our best-selling, high potency, multi-action formula that has been used and trusted by people across the world for more than 20 years! A comprehensive and unique formulation designed to support and strengthen detoxification pathways, to help rid the body of toxins, heavy metals and excess cholesterol. Livatone Plus can assist the liver in repairing and regenerating itself in cases of inflammation or liver damage and supports the gallbladder and digestive system to function optimally. 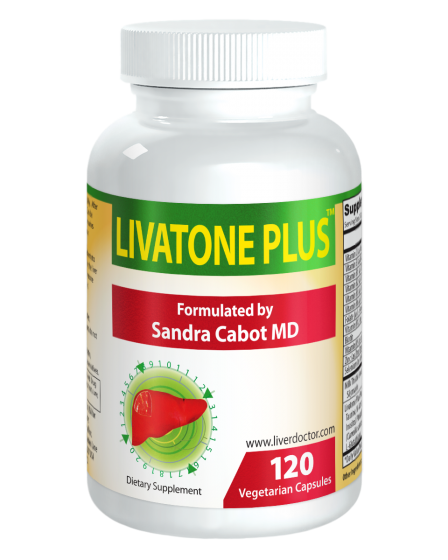 Livatone Plus was formulated by Dr. Sandra Cabot in the mid-90’s when she became aware of the emerging fatty liver epidemic. Dr. Cabot was aware of the importance of using nutritional medicine for the treatment of fatty liver, and knew that there was a need for a powerful liver formula. She formulated Livatone Plus to contain as many active, liver-loving ingredients as possible, to provide the liver with maximal support. It was the first formula of its kind, and has been continually improved over the years to ensure that it is the best liver tonic. What are the benefits of LivaTone Plus? Eliminating toxins: Our formula contains all the essential nutrients (including selenium, B vitamins and vitamin C) that are required by the liver for the removal of toxins, heavy metals and waste products from the body. Speeding up the detoxification pathways reduces the risk of these toxins causing damage and inflammation to cells, tissues and organs. Liver repair: The active ingredient in milk thistle- silymarin may aid in the production and regeneration of healthy liver cells. Our formula contains a potent, therapeutic dose of milk thistle to allow your damaged liver to reap its benefits. Many products on the market dilute their silymarin to save on costs, but at Liver Doctor we use the pure, undiluted extract for maximal liver benefit. Fat burning: A healthy liver is responsible for clearing out excess fat and cholesterol from the body, whilst a sluggish liver will start to store it. Taurine and green tea extract have been added into the formula to support fat digestion and clearance, and to help prevent fat from being deposited in the liver. Livatone Plus could be a great addition to your weight loss routine. 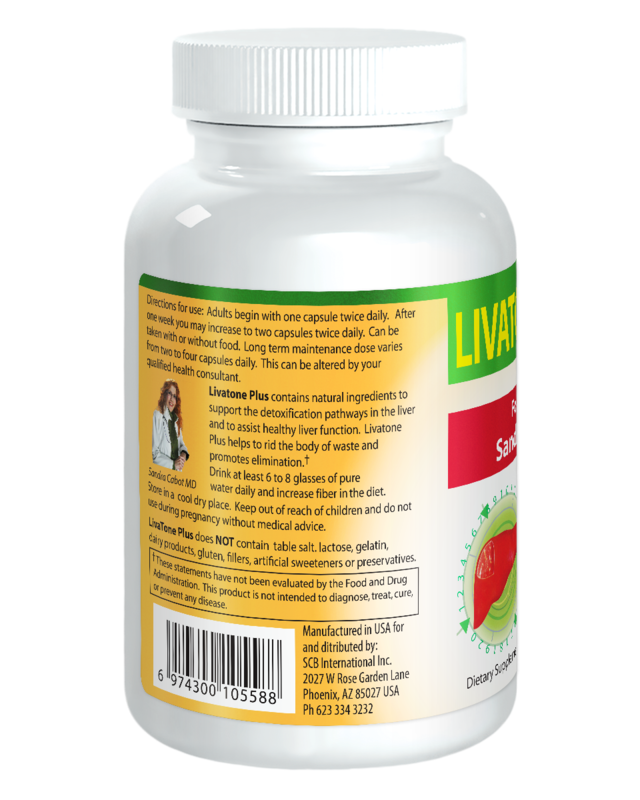 Gallbladder support: Livatone Plus supports healthy bile acid production, and may help to increase clearance of excess cholesterol. It could assist in the management or prevention of gallstones, and to support those with poor-functioning gallbladders. Immune strengthening: Selenium helps to fight against free radical damage, to reduce inflammation in the body and to fight against viral infections such as hepatitis. It is required for the production of glutathione, which is the most powerful antioxidant in the body. Allergy support: Vitamin B12 is required for the detoxification of chemicals in the liver, which can help people who are allergic to sulphites, and vitamin C helps to support the immune system. Low levels of taurine in the body are also common in patients with chemical sensitivities, and has been added in to our Livatone Plus formula. What factors increase my need for Livatone Plus? Milk Thistle: The active ingredient in milk thistle- silymarin aids in the production and regeneration of healthy liver cells and helps to remove toxins from the liver. It has been used for over 2000 years in the treatment of liver disorders and has numerous clinical studies conducted on its effectiveness. Our formula contains a potent, therapeutic dose of milk thistle to allow you to reap the benefits. Many products on the market dilute their silymarin to make the product cheaper to make, but we use the pure, undiluted extract to improve is effectiveness. Selenium: Helps to fight against free radical damage and to reduce inflammation in the body. It is required for the production of glutathione, which is the most powerful antioxidant in the body. Selenium supports and strengthens the detoxification pathways of the liver, and helps to fight viral infections such as hepatitis. Taurine: The major amino acid required by the liver for the removal of toxic chemicals. It is needed for the manufacturing of bile acids, which aid in fat digestion and the excretion of cholesterol from the body. It also assists in liver detoxification for the removal of toxins. Vitamin C: This antioxidants helps to scavenge free radicals in the body, and assists the liver in completing phase two detoxification. It helps to reduce toxic damage to liver cells from chemical overload. It also supports the immune system to fight off infections and to reduce inflammation. B vitamins and folate: This group of vitamins are required for methylation processes of the liver, which help to detoxify the liver from harmful toxins. They are also important for energy production, and supporting healthy nervous system function. 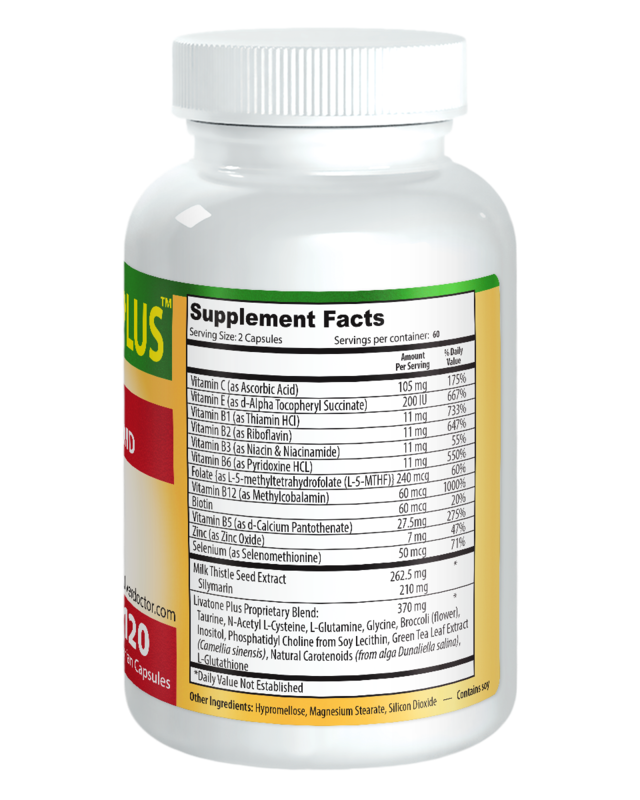 The active form of folate (L-5-methyltetrahydrofolate (L-5-MTHF) and vitamin B12 (methyl cobalamin) has been used in the formula for optimal absorption and utilization by the liver. Alcohol intake can cause deficiency of some B vitamins. Zinc: zinc is required for cell growth and development and can aid in repairing and regenerating damaged liver cells. It has antioxidant properties and is vital for the cellular immune system, to fight off infections. Green tea extract: Contains antioxidant properties to aid in detoxification and also help to prevent fat from depositing in the liver. It could also improve sugar metabolism, and aid in weight loss. N-Acetyl L-Cysteine (NAC): An amino acid that is also required for required for the production of glutathione to help neutralize toxins and strengthen detoxification pathways. NAC also helps to support the immune and respiratory system. I don’t have a liver condition; would I still benefit from it? The liver has two detoxification pathways- phase one and phase two. - Phase one: Breaks down toxins into small metabolites (little pieces). - Phase two: Converts these metabolites from fat-soluble to water-soluble so they can be excreted through sweat, urine or bowel movements. In the majority of people, phase one works a lot faster than phase two. This means that those small toxic metabolites are floating freely throughout the body, wreaking havoc and causing damage and inflammation. It is really important to speed up phase two to remove these toxic metabolites from the body, to prevent them from damaging tissues and organs. Our Livatone plus formula contains the vitamins, minerals and antioxidants that are required for the phase two pathway to occur efficiently and effectively. It supports the liver to remove the toxins rapidly, to minimise harm. Take 1-2 capsules, twice daily with or without food. Adults may begin with two capsules daily, and can increase the dose to 4 capsules daily if needed. Adults take 1 capsule once or twice daily, or as directed by your health practitioner.